A Metal Roof can give your home a unique look and really set it apart. 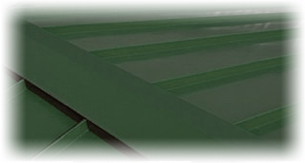 Weinel Roofing is proud to offer metal roof systems such as Standing Seam (Hidden Fastener) and Architectural Paneling. Both metal roofing systems produce two very distinct styles. Weinel Roofing offers a free metal roof estimate at your request. A highly trained Weinel Roofing staff member will come to your home and make a detailed technical drawing of your roof and all its properties. We gather all the information we need to create an honest, fair estimate. Shortly after, you will receive a typed contract that describes in detail, all the work that Weinel Roofing will be conducting as the well as the materials used on your roof. Also, your Weinel Roofing representative will allow you to view both styles of metal roofing systems, and a large variety of colors and patterns. We can also provide information on possible TAX CREDITS offered by the government for your purchase of a metal roof. In addition to installing a high quality metal roof, Weinel Roofing takes pride in a clean, safe work environment. We do NOT use dumpsters, and all trash and refuse is removed from your property at the end of each day. Also the same day we tear off a section of your roof, we cover it back up. When we leave the job site for the day, you can be assured that there will be no leaks in case of an overnight rain.